On the 30th of November, Block Universe held its first event as a joint initiative at KX Tower, Bangkok with the aim of discussing the applications and business models of enterprise blockchain. 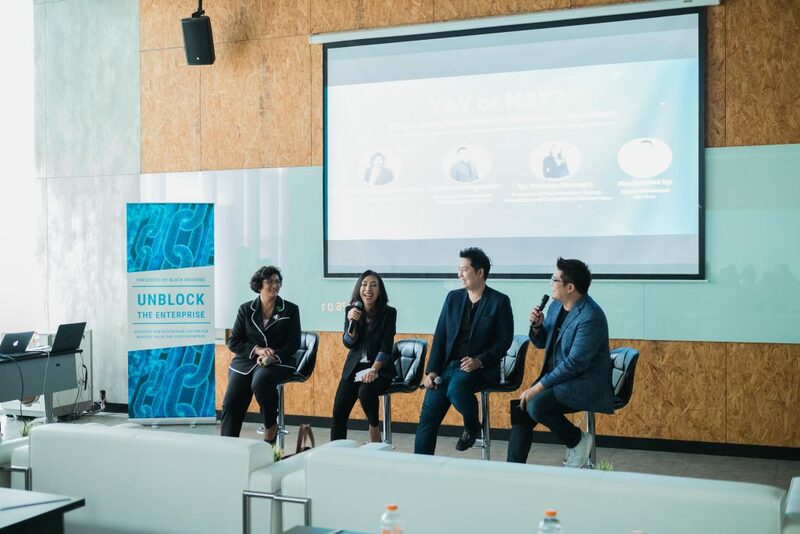 This event known as “Unblock the Enterprise” proved to be a huge success with overwhelming responses featuring attendees from SET (Stock Exchange of Thailand), KTB Bank and more. It presented a local and international panel of experts from China, Singapore, and Thailand, to speak on that day. Block Universe, the joint alliance between BlackBox Labs and Durian Corp, welcomed speakers from a variety of backgrounds on Blockchain, Technology, Finance and more. The Guest of Honor featured was Dr. Sathit Limpongpan, the former chairman of SET/ Permanent Secretary of Ministry of Finance. The event featured a discussion on ‘corporate transformation with blockchain’ which brought a lot of responses from the audience. Start-ups, existing blockchain corporations, financial institutions, and technology companies were all eager to learn more about this topic discussed by the CEO of InterVentures, Paddy Tan, a highly experienced strategic advisor for start-ups and innovation. The audience also received insights from the former IBM Blockchain Head and current CEO of ChainNova, Michael Dong. He introduced the evolution of Blockchain from v1.0 to v3.0 where its early applications were in the form of digital currency such as Bitcoin and moving into Smart Contracts and Derivatives for Enterprises. ChainNova which is an Enterprise Blockchain Platform providing Industrial Solutions has demonstrated itself in various industries and Michael presented such used applications. This got massive responses from the audience who were enthusiastic to learn more. Few of the used cases include The End-to-End Platform with Blockchain for the Largest Rice Farm in China, Supply Chain Finance based on Blockchain in Pharmaceutical Industry and The Cold-Chain Logistics of Smart Freight Platform with Blockchain. This demonstration was followed by the introduction of ChainNova’s new product C4X- an enterprise blockchain product service system. C4X focuses on 1) Traceability platform for digital assets, food/drug security, 2) Financial platform for supply chain, auditing, 3) Public Service platform for shipping, precise poverty alleviation and 4) Cloud Service for Alicloud, IBM and other high-end servers. The event welcomed fireside chats on the topics of Blockchain adoption in 1) China and 2) Thai Enterprises. The speakers included Qian Wang from ChainNova and Terence Ng from Lenovo to speak about the traditional versus tech viewpoint on Blockchain adoption on China. Whereas the chat on the Blockchain adoption in Thai Enterprises featured 3 local experts from KTB Bank, Smart Contract Thailand and Durian Corp. It comprised of M.L Nathchanya Davivongse, the former SEVP of KTB Bank, Sathapon Patanakua, the founder of Smart Contract Thailand and Dr. Sarunya Sensupa, the co-founder of Durian Corp.
Unblock the Enterprise concluded the event by celebrating the launch of Blockchain Lab, an alliance between BlackBox Labs and ChainNova, and the launch of Block Universe, an alliance between BlackBox Labs and Durian Corp. The first inaugural conference by Block Universe is officially over with such great responses and we are excited for more similar conferences to come in the future welcoming a wider audience and educating on the enterprise solutions with blockchain.